Basically, it means how quickly a dollar is being spent and then spent again and again measured over a certain period of time. Why does this matter? It’s considered a valuable indicator as to the state of the economy. If money is rapidly being turned over time and again, then we have a robust economy. It’s not sitting in mattresses. It’s not sitting in overseas accounts to avoid taxation. I don’t consider it the Holy Grail as to the state of the economy, more on that later. What’s interesting about it concerning President Obama is the massive amount of Keynesian style intervention we’ve seen since 2008. We’ve had the Bush/Obama TARP package, the Obama stimulus package as well as the Fed injecting QE1/QE2. These bailout/stimuli type programs are intended as artificial activity on a temporary basis. They are meant to get credit flowing where it isn’t, to spend money where demand has dried up. Essentially, they create economic activity where normal supply and demand doesn’t justify it. So one would expect that to be reflected in the measure of the velocity of money. After all, it doesn’t discriminate as to the source of the velocity, only that it is occurring. Yet, this chart from the St. Louis Fed illustrates that is not at all the case. As you can see, the velocity of money is worse now than even during the Great Depression, this despite massive amounts of artificial stimulation. 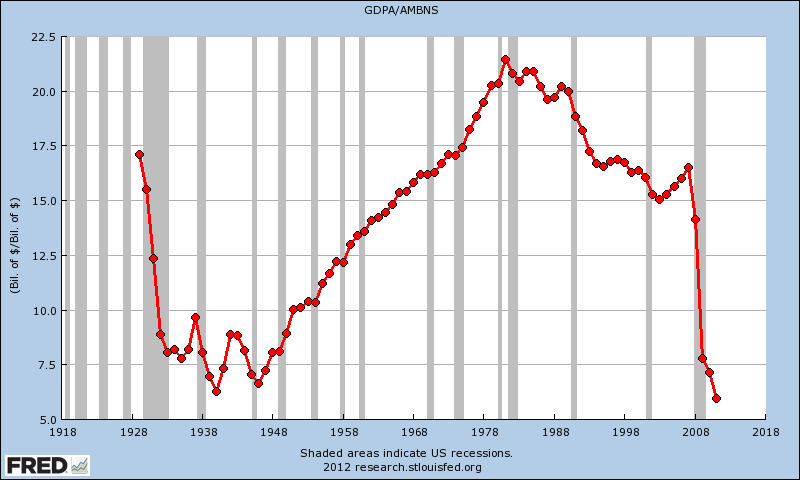 Those that claim that the Obama stimulus worked may wish to take a look at this chart. Choose your poison. If you wish to blame the absence of economic activity on business keeping their $2 trillion dollars on the sidelines, their reasoning is the unstable political climate and tax policy. The fault still falls at the feet of Obama. I stated earlier that I wouldn’t hold even this measure in too high a regard. That’s simply because it can normally be skewed by artificial stimuli. Putting too much into any one indicator is foolhardy as they all have their drawbacks. But suffice it to say that even government ‘busy work’ jobs should succeed in turning dollars over. Not the case here. Unfortunately, even this relies upon the GDP rate, yet another unreliable measure. Another example would be the unemployment rate. Merely work one single hour in a month and you are considered employed. Really? What’s more important is savings and the expansion of wealth. When it comes to you and I, that’s the bottom line. Are we expanding our wealth, saving money and what is that money worth. That last one is the kicker as the Fed has overseen the value of the dollar shrink over 95% since its inception in 1913. Remember, inflation doesn’t just “happen”, it is caused. Manipulating statistics to mask the true state of the value of your money may sound conspiratorial, but the results tend to speak for themselves. Hopefully, you aren’t relying upon the ticker on the bottom of the CNN screen to warn you in time to prepare yourselves for our eventual money bomb to explode.